The text is a little unfair to Cinderella, whom I think gets a bad rap. And, strictly speaking, Belle isn’t a princess. 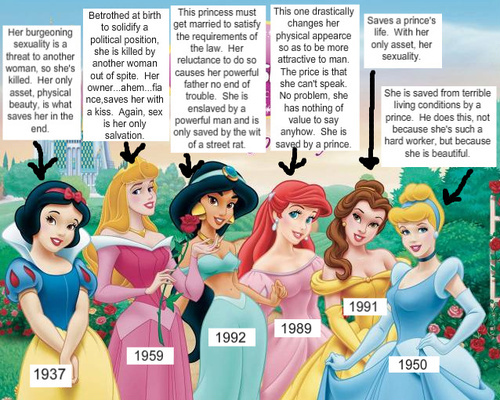 Unfortunately, pretty much dead-on regarding Snow White, Aurora, Jasmine, and Ariel. Pocahontas and Mulan aren’t featured, because they break the Disney Princess mold. Is it pedantic to point out that this isn’t deconstruction but merely straightforward textual analysis? And while I agree with some of these readings, the sequels show much better heroes. And Kim Possible, Hannah Montana, Raven, etc. are far more positive. Disney has got girls figured out at this point. If they got to work on boys, I’d be a lot happier. There’s always the wonderful Tiana, who aspires to own her own business, and winds up employing her handsome yet impecunious prince after he does a lot of growing up. I love Tiana. Ailurophile, I agree: Tiana is very good. Actually, a commenter on my blog (I stole the link, Laura) suggests that Pixar forced Disney to finally update their stereotypes in the mid-90s. I think there may be a point to that, though until Pixar features a genuine princess-type character, we can’t be sure. Jesse and Elasti-Girl don’t quite fit. Dave, I think Disney can do boys very well, when they try. Treasure Planet’s Jim Hawkins is a great character, though unfortunately no one saw that one. Of the current Disney crop, only Phineas and Ferb stand out among all the other loser goof-balls (all the boys on Hannah Montana, Zeke and Luther, etc. etc..) all the HSM characters are pretty much non-entities as role models/characters.